Katelyn Ohashi has earned five perfect scores for her floor routine, and is ranked No. 1 on the event going into the postseason. 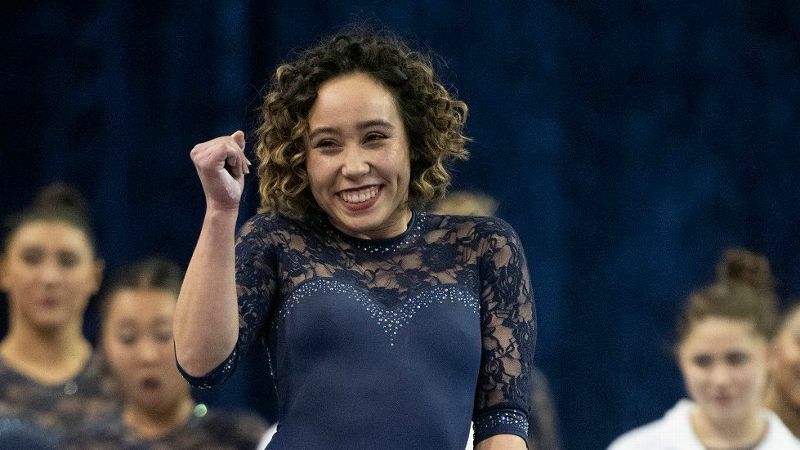 Gymnastics fans have been obsessing over Katelyn Ohashi's floor routine since the moment she unveiled it at the beginning of the season. 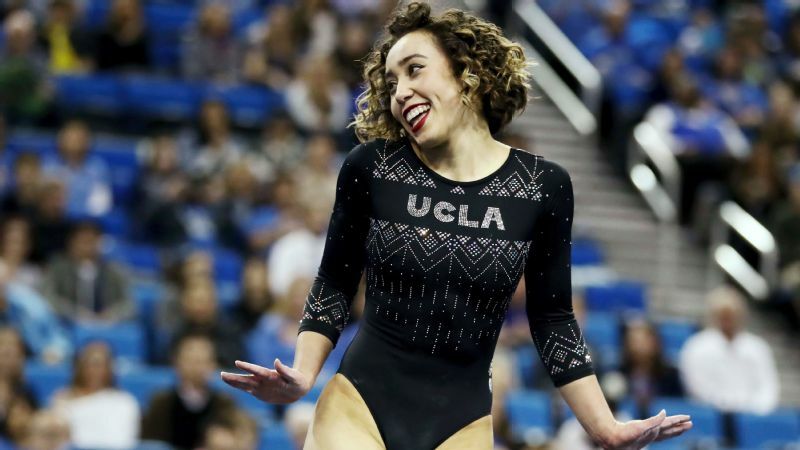 Despite the fanfare, the UCLA gymnast will debut a new floor routine on Saturday at the Pac-12 championships -- without Michael Jackson music or dance moves. Ohashi, 21, received her first 10.0 of the year at just the second meet of the season, and her routine -- a mash-up of music from Jackson and other artists, complete with incredible tumbling and infectious choreography -- went instantly viral. UCLA's original video of it has been viewed over 35 million times on YouTube, and when you factor in videos on Twitter, Facebook and from other meets of the year, it's safe to say almost everyone has seen the routine by now. As the video racked up views, Ohashi's star continued to rise, and she's been featured on the pages of The New York Times, Rolling Stone and People, as well as on ABC News and Steve Harvey's talk show. For Ohashi, who had spent months painstakingly choreographing and putting the music mix together, it was a validation of all of her hard work and attention to detail. She has since received four more perfect scores for her routine, and has been named the Pac-12's Specialist of the Week a record six times. The reigning national champion on the event, she's ranked No. 1 in the country entering the postseason. However, as proud as she is of the routine, she felt conflicted following the release of "Leaving Neverland," the two-part HBO documentary about Michael Jackson and his alleged sexual abuse of children. She no longer felt comfortable using his music, or his moves, and made the deliberate decision to remove his influence entirely. She now boasts a routine set to artists that include Tina Turner, Beyonce and Janet Jackson. "Katelyn and I have been talking about having two routines this year ever since this summer," UCLA head coach Valorie Kondos Field said. "It was a little bit of a hard decision once we saw how much people enjoyed her routine. Could we top it? It was hard enough to get music that could top last year's routine. "But [former UCLA gymnast and dancer] Ariana Berlin kept working on it and working on it, and finally she came up with something that Katelyn and I just felt was even more joyful, and the fact that it was by all female artists made it a no-brainer. It really wasn't that enormous or momentous of an undertaking because it's something we'd been thinking about for months." But still, with an intense competition schedule throughout the season, as well as end-of-the-quarter finals for her classes this week, it was no small feat for Ohashi to completely change her routine. How did she manage to do it? We caught up with Ohashi to get the exclusive -- and a video of the new routine. espnW: What prompted the change in the routine, and why now? Katelyn Ohashi: I have been wanting and bugging Miss Val for two floor routines since this summer, and we wanted to wait until after finals calmed down. I just really wanted a women's empowerment routine because it's a big part of my platform. espnW: Did the outcry towards Michael Jackson after the release of "Leaving Neverland" factor into your decision? Ohashi: Honestly, in the back of my mind it did, because of the platform that I have. The goal of my routine is pure joy, and after the documentary, not everyone was feeling that way, and you can never discredit someone's feelings. So yes, it was in the back of my mind because my main goal is to find as much joy as possible in this routine. espnW: How did you pick the new music? Can you describe the mix of songs now? Ohashi: Tina Turner had a part in the last routine, and we wanted to keep her in, along with Janet Jackson. espnW: I know you added Beyonce in here as well -- was it intentional to feature all female artists? Ohashi: It was indeed deliberate. espnW: How hard was it to change the choreography? Ohashi: Honestly, it was a blast. This was so much more fun than I've ever had doing a routine, and I'm so excited for everyone to see it. espnW: How long did the process take for creating this new routine? Ohashi: It literally took an hour-and-a-half, and this week I got in and really worked on it and tried perfecting it before I could compete it this weekend. espnW: What's your favorite part of this routine? Ohashi: Beyonce! The dance is so much fun. I know I have a blast doing it, and I hope everyone has a blast dancing along with it as well. espnW: What are you most excited for people to see with this? Ohashi: I think a different style of dancing. I had done Michael Jackson the last two years, so this showcases a different style of dancing for me. It's a more pop style of dancing. espnW: Are you nervous about forgetting any of the new choreography? Ohashi: [Laughing] Well, you guys won't know if I do, so if I do, I'll just improv. That's what I'm used to doing anyway! espnW: You're the defending floor national champion, do you feel pressure to defend the title? Did that make changing this routine more difficult? Ohashi: Honestly, I would say no. The judges are judging my tumbling more so than anything, and that is staying the same. As far as the pressure of defending my title, I won it last year, so no matter what happens I have one under my belt, so it wouldn't be the end of the world. I just want to have fun competing a new routine, and I want to have fun throughout the rest of the season. espnW: What do you hope fans take away, or remember, from this routine? And from your amazing collegiate career? Ohashi: I hope they can remember how I speak openly about a lot of the issues that are close to my heart. I think I have a passionate heart about women's empowerment, and I am very compassionate towards people who have spoken out. And I hope that by changing my routine, I can be remembered for being more than a gymnast. It's about understanding issues and having a bigger platform than just the sport.